Targeted surgical ablation and use of personalized molecular genomics may lead to better outcomes. • Despite being the most common primary intraocular malignant tumor in adults, uveal melanoma continues to represent a therapeutic challenge. • Most ocular oncologists observe small uveal melanoma before deciding on a definitive treatment plan because treatment with brachytherapy carries significant visual morbidity. • Therapeutic options for metastatic uveal melanoma are limited, but advances in gene expression profiling of uveal melanoma may allow earlier treatment of tumors with less morbid strategies. Molecular tests have been developed to assess prognostic information for these tumors. These tests now include karyotype analysis, comparative genomic hybridization, fluorescence in situ hybridization, multiplex ligation-dependent probe amplification, mutational profiling, and gene expression profiling (GEP), either by incisional biopsy or fine needle aspiration biopsy. Although therapeutic options for metastatic uveal melanoma are limited, molecular classification of uveal melanoma may allow ocular oncologists to develop better management strategies. This article discusses molecular genomics, particularly GEP, and its role in the management of patients with small uveal melanoma. Castle Biosciences has developed a commercially available assay (DecisionDx-UM) that allows clinicians to routinely provide prognostic information to their patients with uveal melanoma.12 The assay stratifies tumors into three classes: 1A, 1B, and 2. Patients with class 1A, 1B, and 2 tumors have a 2%, 11%, and 72% incidence of metastasis at 5 years, respectively. However, the data from this assay may be limited by tumor genetic heterogeneity. A recent study by Augsburger et al found that in 11% of cases in which two fine needle biopsy aspirates were performed, the two aspirates had discordant GEPs.13 This difference was accentuated in smaller tumors. Therefore, sampling multiple areas may lessen the probability of underestimating the prognostic risk and may yield higher positive predictive values in patients with class 1 tumors. GEP has also been analyzed in conjunction with tumor size. In a study that evaluated 299 patients with posterior uveal melanoma with a mean follow-up of 33 months, patients with class 2 tumors and tumor basal diameter of less than 12 mm had a lower risk of metastasis compared with patients with class 2 tumors with larger basal diameters.14 A similar study performed by Walter et al that included 339 patients (mean follow-up 33 months) also suggested that class 2 tumors with basal diameter of less than 12 mm had a low risk of metastasis.15 These findings may be explained by lead-time bias, especially because the mean follow-up time in both studies was approximately 30 months. However, these studies suggest that earlier treatment of class 2 tumors may be associated with improved survival. Figure 1. 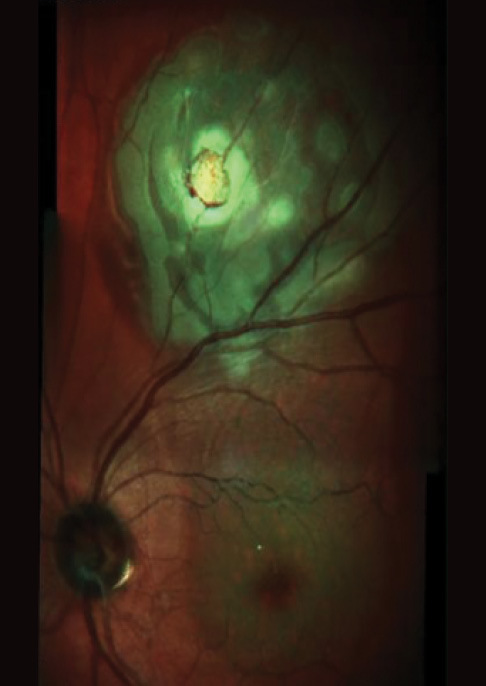 Small malignant melanoma with significant orange pigment and exudative retinal detachment. Figure 2. Spectral-domain OCT scan 1 day after transvitreal biopsy. Figure 3. Multicolor montage of fine needle aspiration biopsy site 1 day postoperative. These studies suggest that TTT performed by trained ocular oncologists may lead to reasonable control rates in selected patients. Historically, patients with suspected uveal malignant melanoma routinely underwent enucleation to eradicate the primary tumor. In 1985, the Collaborative Ocular Melanoma Study (COMS), the largest randomized controlled trial to date addressing uveal melanoma, determined that brachytherapy was as effective as enucleation in the treatment of uveal melanoma. Furthermore, the COMS found that increased basal diameter and increasing age were associated with increased risk of metastasis-associated death.6,7 It is because of this trend in metastasis-associated death that ocular oncologists in the past 2 decades have gravitated toward treating smaller tumors when high-risk characteristics are present.16 However, small uveal melanomas are a challenging diagnosis due to their clinical overlap with benign nevi. In addition, treatment with brachytherapy has significant visual morbidity. Therefore, most ocular oncologists, in line with the COMS investigators, observe small lesions before deciding on a definitive treatment plan. Advances in GEP of uveal melanoma may allow us to treat earlier using less morbid therapeutic strategies. The facts that metastasis is likely to occur early in the disease process of uveal melanoma and that clinicians often delay definitive treatment are key to understanding why metastasis rates have not changed during the past 3 decades. It also highlights the need for the development of individualized risk-dependent treatments that can decrease metastasis rates. Treatment of small uveal malignant melanoma (Figure 1) is controversial. GEP allows prognostication for small uveal melanomas with minimal surgical risk (Figures 2 and 3). This technology affords clinicians the opportunity to treat earlier in the disease process, thereby minimizing the likelihood of metastatic spread. At our center, tumors identified by GEP as class 2 tumors subsequently undergo iodine-125 (I-125) brachytherapy with a cumulative dose of 85 Gy to the tumor apex. GEP class 1 tumors do not undergo plaque brachytherapy but are observed closely. We have performed more than 50 treatments using this protocol. 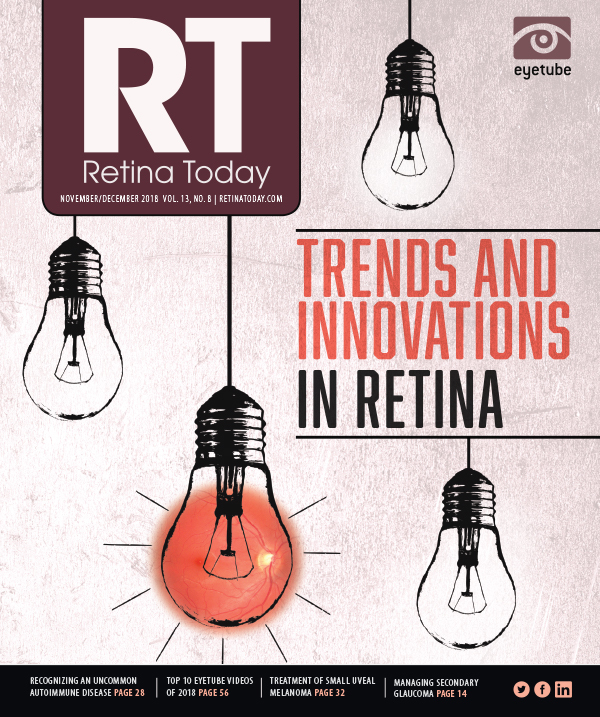 Retinal detachment risk is similar to that of eyes after cataract surgery,19,20 but this may vary significantly depending on surgeon expertise. A study that compared immediate treatment of medium uveal melanomas against delayed treatment found increased mortality in patients with delayed therapy compared with the findings of the COMS.22 A previous report found a similar result.23 Therefore, observation of small uveal melanomas and atypical nevi may be associated with some risk of metastasis. A randomized prospective clinical trial comparing visual and survival outcomes in patients managed by observation versus prompt treatment is needed. At this time, clinical examination cannot reliably predict when a tumor will exhibit micrometastasis with remission. We know from other fields of medicine that patient survival and outcomes are heavily dependent on early identification and treatment of small neoplastic lesions. Larger tumors are more invasive and present a much higher risk of metastasis. Once tumor cells have left the primary focus, prognosis declines significantly. Patients should be aware of the risks associated with observation of small lesions. The morbidity associated with biopsy might be lower than the risk of mortality associated with observation. Further studies will elucidate long-term outcomes. 1. Villegas VM, Monagas M, Campbell J, Murray TG, Serrano L. Selective intra-arterial embolization for advanced extrascleral uveal melanoma. Ocul Oncol Pathol. 2017;4(1):44-47. 2. Singh AD, Turell ME, Topham AK. Uveal melanoma: trends in incidence, treatment, and survival. Ophthalmology. 2011;118(9):1664-1678. 3. Damato BE, Heimann H, Kalirai H, Coupland SE. Age, survival predictors, and metastatic death in patients with choroidal melanoma: tentative evidence of a therapeutic effect on survival. JAMA Ophthalmol. 2014;132(5):605-613. 4. Decatur CL, Ong E, Garg N, et al. Driver mutations in uveal melanoma: associations with gene expression profile and patient outcomes. JAMA Ophthalmol. 2016;134(7):728-733. 5. Murray TG, Markoe AM, Gold AS, et al. Long-term followup comparing two treatment dosing strategies of (125) I plaque radiotherapy in the management of small/medium posterior uveal melanoma. J Ophthalmol. 2013;2013:517032. 6. Collaborative Ocular Melanoma Study Group.The COMS randomized trial of iodine 125 brachytherapy for choroidal melanoma: V. twelve-year mortality rates and prognostic factors: COMS report No. 28. Arch Ophthalmol. 2006;124(12):1684-1693. 7. Damato B. Legacy of the collaborative ocular melanoma study. Arch Ophthalmol. 2007;125(7):966-968. 8. Kujala E, Mäkitie T, Kivelä T. Very long-term prognosis of patients with malignant uveal melanoma. Invest Ophthalmol Vis Sci. 2003;44(11):4651-4659. 9. Onken MD, Worley LA, Ehlers JP, Harbour JW. Gene expression profiling in uveal melanoma reveals two molecular classes and predicts metastatic death. Cancer Res. 2004;64(20):7205-7209. 10. Schopper VJ, Correa ZM. Clinical application of genetic testing for posterior uveal melanoma. Int J Retina Vitreous. 2016;2:4. 11. Onken MD, Worley LA, Char DH, et al. Collaborative Ocular Oncology Group report number 1: prospective validation of a multi-gene prognostic assay in uveal melanoma. Ophthalmology. 2012;119(8):1596-1603. 12. Harbour JW, Chen R. The DecisionDx-UM gene expression profile test provides risk stratification and individualized patient care in uveal melanoma. PLoS Curr. 2013;5. 13. Augsburger JJ, Corrêa ZM, Augsburger BD. Frequency and implications of discordant gene expression profile class in posterior uveal melanomas sampled by fine needle aspiration biopsy. Am J Ophthalmol. 2015;159(2):248-256. 14. Corrêa ZM, Augsburger JJ. Independent prognostic significance of gene expression profile class and largest basal diameter of posterior uveal melanomas. Am J Ophthalmol. 2016;162:20-27. 15. Walter SD, Chao DL, Feuer W, Schiffman J, Char DH, Harbour JW. Prognostic implications of tumor diameter in association with gene expression profile for uveal melanoma. JAMA Ophthalmol. 2016;134(7):734-740. 16. Shields CL, Manalac J, Das C, Ferguson K, Shields JA. Choroidal melanoma: clinical features, classification, and top 10 pseudomelanomas. Curr Opin Ophthalmol. 2014;25(3):177-185. 17. Mashayekhi A, Shields CL, Rishi P, et al. Primary transpupillary thermotherapy for choroidal melanoma in 391 cases: importance of risk factors in tumor control. Ophthalmology. 2015;122(3):600-609. 18. Shields CL, Shields JA, Perez N, Singh AD, Cater J. Primary transpupillary thermotherapy for small choroidal melanoma in 256 consecutive cases: outcomes and limitations. Ophthalmology. 2002;109(2):225-234. 19. Reddy DM, Mason LB, Mason JO 3rd, Crosson JN, Yunker JJ. Vitrectomy and vitrector port needle biopsy of choroidal melanoma for gene expression profile testing immediately before brachytherapy. Ophthalmology. 2017;124(9):1377-1382. 20. Bagger M, Tebering JF, Kiilgaard JF. The ocular consequences and applicability of minimally invasive 25-gauge transvitreal retinochoroidal biopsy. Ophthalmology. 2013;120(12):2565-2572. 21. Shah NV, Houston SK, Markoe A, Murray TG. 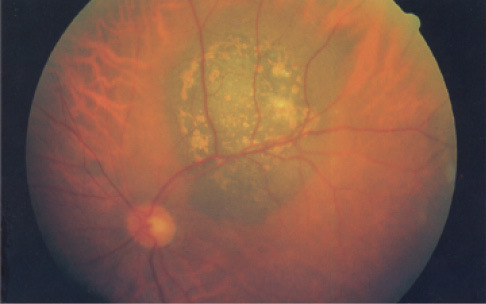 Combination therapy with triamcinolone acetonide and bevacizumab for the treatment of severe radiation maculopathy in patients with posterior uveal melanoma. Clin Ophthalmol. 2013;7:1877-1882. 22. Sobrin L, Schiffman JC, Markoe AM, Murray TG. Outcomes of iodine 125 plaque radiotherapy after initial observation of suspected small choroidal melanomas: a pilot study. Ophthalmology. 2005;112(10):1777-1783. 23. Straatsma BR, Diener-West M, Caldwell R, Engstrom RE; Collaborative Ocular Melanoma Study Group. Mortality after deferral of treatment or no treatment for choroidal melanoma. Am J Ophthalmol. 2003;136(1):47-54.